Well anyone who has followed me on this blog for a while will know I LOVE Waratahs. There is such a majesty & structural quality to these particular Australian wildflowers not withstanding their bright red colouring with deep green leaves & the fact the flowers occur on long stems coming up from the ground. They really can be ‘seen from afar’ as their name means. For a while now I have planned to do a Tryptich design using waratahs as a kind of companion print for my Flannel Flower Tryptich. This particular print was a commission for someone as a gift for his wife’s birthday. Did I mention I also LOVE flannel flowers too? Last year after my shoulder surgery I found it really difficult to work at all for a few months which was most frustrating! I knew I had to slowly get back so I started with thinking through ideas for new designs & taking some photos. 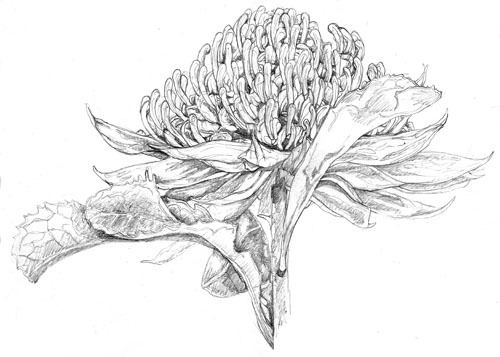 Eventually I was able to at least draw so one of the first artworks I started on was my Waratah Triptych. I already knew I wanted to make it into a triptych & I had taken some photos pf both red and white waratahs over the years so decided to incorporate both into this design. I worked as I usually do. 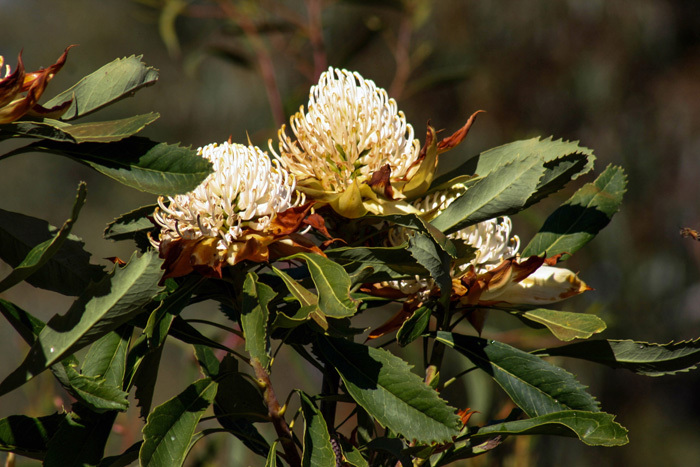 First with the framework for the design, then trawling through the hundreds of images I have of waratahs and finding suitable ones for this particular artwork. This process is interesting for me as I gradually reduce the amount of images I want to work with so I refine the vision I have for this work. I ask questions like – is my point of view from below or above? do I want to abstract any of the images or stay more true to for? How simple do I want the work to be visually? How much black do I want to incorporate? DO I really want to keep the defining structure I started with or would I prefer to break out and change it a little? or a lot? Eventually I end up with a series of images which I will use as the basis of the work. I then start the drawing. Drawing is a process I love and have always loved. I feel that all artists no matter their medium of choice a strong skill base in drawing will always hold them in good stead. It teaches you to look more closely and especially in my case where I like the get the wildflowers I use botanically correct. Even if in the carving of the wildflowers compromise is made as to how they are depicted due to the process of carving lino, I know that they have started as botanically correct. 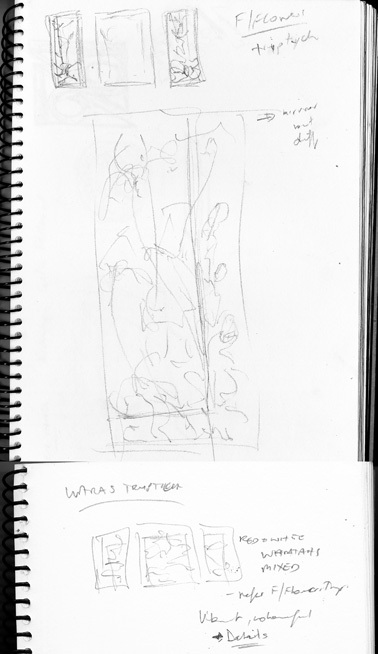 These are the final drawings of the three panels of the triptych. When it comes to working the drawings into designs that can be carved I again work through creating black and white inked versions. This refines my designs and allows me to experiment with what I think I may be able to carve. These days after having to have shoulder surgery, I really value the ability to still be able to carve my linocuts so I guess for me if I have a clear template of what I want to carve it means I will hopefully will be able to a long time into the future. I then transfer these final designs onto the lino ready to carve. I must say after initially deciding to start small when starting back carving I just could not resist getting stuck into these three larger panels! It was weeks of carving and I must say did challenge my shoulder’s capacity to comply & caused a bit of pain. But I do have the most wonderful masseuse and physiotherapist who both help keep me on the straight and narrow & take away the pain! For this particular design I decided to just do a colour rough using photoshop just to get an idea of the balance of the colour before handcolouring. Finally I get to print the designs and then handcolour them! Finally I get to see the original concept from a few years ago actually come to fruition. I am really pleased with the results. Here is a little video about the whole process from inspiration to Fine Art Linocut.